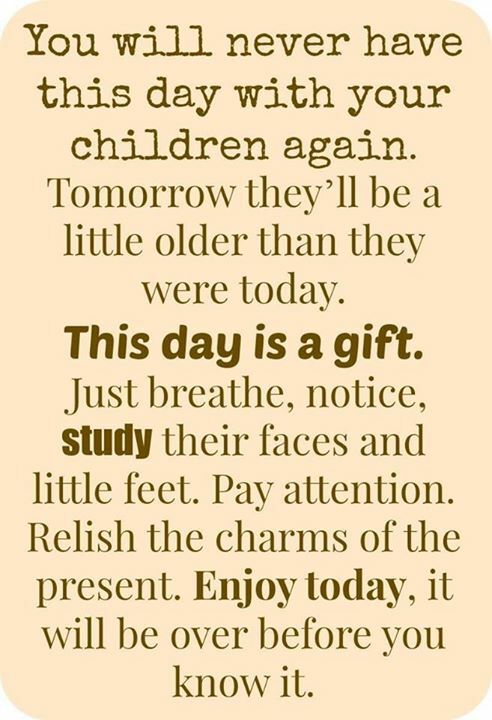 YOU WILL NEVER HAVE THIS DAY WITH YOUR CHILDREN AGAIN. TOMOR - ProudMummy.com the Web's Community for Mums. YOU WILL NEVER HAVE THIS DAY WITH YOUR CHILDREN AGAIN. TOMORROW THEY'LL BE A LITTLE OLDER THAN THEY WERE TODAY. THIS DAY IS A GIFT. JUST BREATHE, NOTICE, STUDY THEIR FACES AND LITTLE FEET. PAY ATTENTION. RELISH THE CHARMS OF THE PRESENT. ENJOY TODAY, IT WILL BE OVER BEFORE YOU KNOW IT.